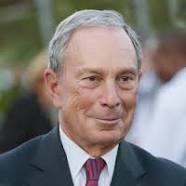 Mr. Bloomberg is a Jew who may or may not be awaiting the Messiah’s first coming. Despite all of his money, he has not been able to buy the sense to recognize that the Son of God has already come, paid sin’s price, and is imminently expected for a second earthly arrival. No one can “buy” or “work” his way into heaven. Only Jesus is able to approve a heavenly welcome…with interview, I do hope! This entry was posted in Uncategorized and tagged Easter, good works, Michael Bloomberg. Bookmark the permalink.